The beck is crossed and the English surrounded. The victory goes to the invaders. King Harald takes his best men down to the river where he leads them in a charge across the beck. The opposition is well armed but are no match for the powerful charge unleashed by the Norsemen. The archers are keeping behind the warriors but this would not provide the opportunity to slay King Harald. The group defending the crossing point beside the river is led by Earl Edwin. Once they have been pushed back, the rest of the Noresmen are able to reach the English bank. They will soon be able to surround the English troops at the ford. This is the turning point of the battle. Earl Morcar is making slow but steady progress at the crossing but will be in for a shock when he finds the Norseman are behind him. One English warrior finds himself surrounded. He sheds his shield and wields his axe with both hands, hoping to inflict as much damage as possible before he is overwhelmed. Once the people have crossed the beck they could outflank the shield wall of the English. The field is littered with bodies. One group is partly submerged in the marsh. 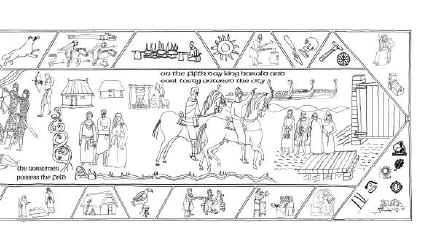 All the images are derived from the Bayeux Tapestry. The English on the two flanks will manage to fight their way to safety and both of the earls survive. King Harold who has just released his army defending the south. Now back in London he receives the news brought from the north. He will quickly gather another army and set out to defend the northern earls. Having flattered the bird for the fine gloss and sheen on its feathers, the fox begs the bird to let it hear his wonderful voice. As the vain birds begins to sing, the cheese drops from its mouth. Earl Morcar is tempted to leave the high ground by the weak warriors that king Harald has sent against him. While Morcar is distracted, King Harald launches his attack beside the river and ‘gets the cheese’. The goddess Rhiannon provided a parable for those who face great odds. She was part of the later Celtic tradition. A beautiful noble lady, she was married to a king. She was falsely accused of killing and eating her own child but is eventually vindicated. However, she endured the hardship and shame until her innocence was proved. The image is a composite of the goddess and one of her symbols, the horse. She will be subdued by the power and might of King Harald’s symbolic raven, but would be vindicated soon. Some traditions have Rhiannon as the goddess whose hand rises from the lake to present the sword to King Arthur. The bent sword is sometimes found in the early graves of Viking warriors. The raven cries out at the sight of all the carrion. The flax plant grows along the marsh area where the battle was fought and would be harvested for the complex process of making linen. The scenes are dominated by casualties. A nun is seen administering some comfort to someone wounded by an arrow. There is a tradition that women would attend a battle to provide some aid but the evidence is limited. The right-hand scene of warriors lying dead or dying, are being further assaulted with a spear, sword or axe. At the start of the next panel, a burial party can be seen interring bodies. When these were excavated at nearby St Andrewgate, they were found to have multiple wounds.